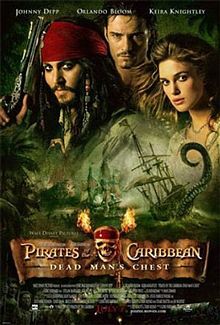 When the East India Trading Company arrives and takes over Port Royal, Will Turner (Orlando Bloom) and Elizabeth Swann (Keira Knightley) are forced to track down Captain Jack Sparrow (Johnny Depp) and force him to give them his enchanted compass. Sparrow, however, is busy running from Davy Jones (Bill Nighy) – the supernatural ferryman of the dead who is owed 100 years of servitude for a boon granted a decade ago. Pirates of the Caribbean: The Curse of the Black Pearl was a film purposefully built to begin a franchise. When it became a massive box office hit, Walt Disney Pictures was quick to commission not one but two sequels – shot back to back in the single-most expensive film shoot of all time. The films combined formed one long narrative broken into two halves, clearly adopting in part George Lucas’ Star Wars sequels as a narrative inspiration. The third film in the series could tie everything together into one massively over-extended finale, while the second was simply tasked with making the heroes’ situation as dire and hopeless as possible. To a large extent Dead Man’s Chest does this with aplomb: tonally speaking, it is a significantly darker film than its predecessor. It is also visually darker and more gloomy, with a brooding and more gothic score to match. The film also takes the success of the supernatural elements in The Curse of the Black Pearl and doubles down upon them. That film balanced adventure and horror, whereas Dead Man’s Chest advances into full-blown fantasy. The film is packed from end to end with witchcraft, sea monsters, magical curses and sword-wielding fish people. Nowhere is that more clear than in Davy Jones, who remains today – more than a decade later – one of the most impressive achievements in visual effects ever committed to film. He is a visual marvel: a pirate captain slowly corrupted by the sea until his entire body has replicated its denizens. His face is a Cthuloid mass of tentacles. One arm has transformed into a claw, one leg into a chitinous stump. The computer-generated imagery is as close to faultless as one could imagine, most impressively in all manner of environments: day or night, dry or wet. Most impressive of all is how the film manages to retain Bill Nighy’s own eyes and mouth, allowing the visual effects to support rather than replace a human performance. It is a stunning performance as well, with Nighy affecting an oddly perfect Scottish accent and clearly relishing playing such a villainous part. That enjoyment is contagious: he is a tremendously entertaining villain. Tom Hollander makes for a satisfying co-villain as East India representative Lord Cutler Beckett. His is a more subtle and insidious evil, and the film is wisely happy to leave the spotlight on Jones while carefully developing Beckett into a larger villain in the third film. Also very strong is Stellan Skarsgård as Will Turner’s deceased father Bill “Bootstrap” Turner, cursed in death to serve Davy Jones for 100 years. Skarsgård is one of the most reliably strong performers Hollywood has, and makes an immediate sympathetic impact. Both Orlando Bloom and Keira Knightley seem vastly improved in this second film. Both are given stronger material with which to work for one thing, but each also seems more confident and self-assured. Sadly Johnny Depp, presumably buoyed by the hugely positive reaction to his first turn as Jack Sparrow, transforms the part into something of a mugging caricature. He was certainly over-the-top in the first film, but there it was better leavened with moments of seriousness and showcases of Sparrow’s more manipulative nature. Here the balance is off. and it weakens his character considerably. There is also the problem of re-introducing Sparrow into the story. Not only do audiences have to sit through an unnecessary sequence involving an escape from a cliff-side castle to retrieve a picture of a key – none of which is ever really explained – they subsequently have to watch a lengthy and relatively weak set of scenes featuring Sparrow being worshipped as a God by an island of cannibals. It is not particularly amusing stuff all things considered, it is certainly moderately racist, and it is also narratively redundant. It really drags out the film’s first act, and is one of the main reasons that this second Pirates feature fails to match the appeal of the first. It also suffers the same problem facing all middle parts of a trilogy: it begins in the middle with an interrupted wedding, and it ends in the middle with the villains ascendant and the heroes without hope. The climax, however, is suitably apocalyptic, with the crew of the Black Pearl facing off against a seemingly unstoppable Kraken. A final epilogue is the icing on the cake, setting up the third film and heralding the return of a much-loved and presumed-dead character. There is so much good material in Dead Man’s Chest and it really is that messy narrative structure that lets it down. It is a very good fantasy adventure when with a little more thought it could have been great instead.